" So I answered and spake to the angel that talked with me, saying, What are these, my lord? 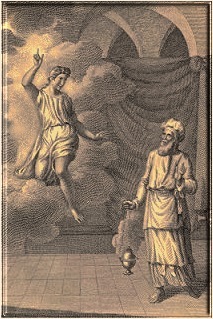 The books of reference used for this study of the book of Zechariah were the Bible, King James Version, called "The Companion Bible", Publisher Kregel; Strong's Exhaustive Concordance of the Bible, numbered to the Hebrew, Chaldee, and Greek, and English, coded to the Strong's Concordance numbers. "Literal Prophecy of First Vision"
Chapter 2 "Third Vision - Yahveh's Purpose"
Chapter 5 "God's Eternal Enemies, 6th and 7th Visions"
Chapter 6 "Invisible Agencies, the Horses"
Chapter 7 "Literal Prophecies, Dated." Chapter 8 "Restoration of Jerusalem"
"Rejoice for the Coming of Christ, the First Burden"
Chapter 11 "Prophecy with Symbols." Chapter 12 "Threatening Against Enemies, Restoring Judah"
Chapter 13 "Evil is Removed"
Chapter 14 "The Lord's Day"